As I had earlier this month, the 3D printer and PC Milling machine are sounding the death knell for Big Brother’s Gun Control schemes. The technology is getting to the point where ease and affordability of these machines has all but gutted the gun controllers argument that gun control is actually meant to target criminals. We all know that the truth is more nefarious than that. Gun control is not about safety but about control. Control of the populace. When anyone can plug in a program, some metal and some time and come away with a functioning firearm the argument for gun control all but falls apart. Yes. Criminals are going to use this so they don’t have to steal guns anymore, or go to Mexico and buy back Obama’s guns that he smuggled across the border. Also patriots will begin using these machines because the less interference and harassment that they have to tolerate from the hands of the government the better. If the first 24 hours of sales is any indication, then gun control will soon find itself even more obsolete than it currently is. 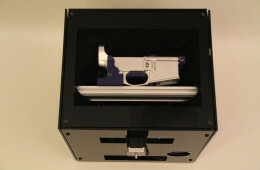 On Wednesday, Cody Wilson’s libertarian non-profit Defense Distributed revealed the Ghost Gunner, a $1,200 computer-controlled (CNC) milling machine designed to let anyone make the aluminum body of an AR-15 rifle at home, with no expertise, no regulation, and no serial numbers. Since then, he’s sold more than 200 of the foot-cubed CNC mills-175 in the first 24 hours. That’s well beyond his expectations; Wilson had planned to sell only 110 of the machines total before cutting off orders. His entire stock sold out. To the point where Wilson is hiring in order to meet demand that far exceeded his projections. Technology and capitalism, beating back the archaic and draconian hand of gun control. Freedom will find a way.